Is there a difference between girls’ toys and boys’ toys? Well, yes, quite often there is. Sometimes it’s a fairly obvious distinction; as a rule of thumb girls are given dolls, cradles, dolls’ houses, toy brooms, fluffy creatures with long hair and anything pink. Boys tend to be given trains, cars, guns, space toys, science kits and, most certainly, nothing pink! There are exceptions of course, and while children are small they aren’t so fussy; it’s only when they start nursery school that peer pressure dictates the toys they choose. Lots of toys are suitable for both sexes; puzzles, board games, Lego, Fuzzy Felt, puppets and tricycles for example, though even then there can be differences. Puzzles might feature either a girlie picture of fairies or a boy-appealing ferocious dinosaur while Fuzzy Felt will be ballet or pirates. Even Lego can be girl-orientated when it contains pink bricks and small dolls. Of course, the classic toy for a girl is a doll; from earliest times it was assumed that the woman’s role in life was to care for babies and to create a home while man was the hunter or worker. Even today, when women have far more freedom and independence, and are increasingly taking over occupations once regarded as male, small girls are still given dolls. Look round any toyshop dolls of all kinds, from babies to fashion and fairies to mermaids predominate, usually sold in pink boxes or wearing pink sparkly outfits. Many girls’ toys are traditional “ our great grandmothers, even their great grandmothers, might have played with some of them. 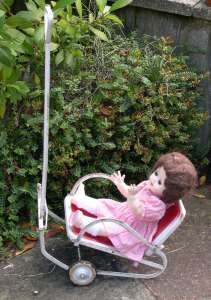 Things such as toy sewing machines, skipping ropes, tea sets, knitting sets, dolls’ prams, music boxes, clockwork dolls and tinkle tonks. The greatest revolution in toys began just after the Second World War, and was caused by the plastics explosion. Plastics transformed the toy industry “ at last there was a material which was light, colourful, versatile, easy to mould and difficult to break. A further explosion took place in the 1980s with the introduction of ‘collectable series toys’, following on the heels of the Star Wars toys of the late 1970s suddenly manufacturers discovered an exciting way of earning more money. By issuing toys in sets, children would need to buy several before they could satisfactorily play with them. My Little Pony was one of the most popular of the new lines, though many parents and teachers loathed the pastel pink creatures which, they believed, had no play value at all. The ponies had no moving parts, so it just seemed that their young owners combed and plaited the manes and tails. Yet that wasn’t strictly true as most girls created their own imaginative story lines, building up pon y worlds as they bought more and more ponies with names such as Cotton Candy, Applejack and Blossom. Over the years, dozens of different types of ponies made their appearance, often with special features such as rainbow or glittery manes, sparkling eyes, sleep eyes, transparent bodies, thick curly tails, scented or musical. Some featured translucent wings or magic heat-appearing motifs. 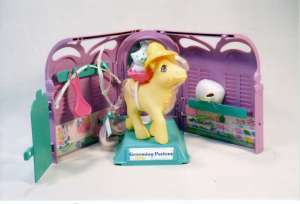 There were clumpy male cart-horse types, unicorns, sea-horses, flutter ponies (very fragile, with delicate wings which soon broke) and Pegasus ponies too, all made by Hasbro, who had certainly struck gold with this product. 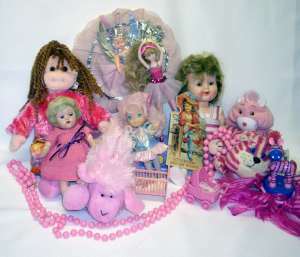 Also on the scene in the 1980s was the ‘World of Strawberry Shortcake’, a large range of dolls and accessories, the most popular being a series of scented small dolls, 5Â½ inches high, with slightly overlarge heads. Jointed at the hips, neck and shoulders, each doll was marked ‘American Greetings Corps. 1979′. 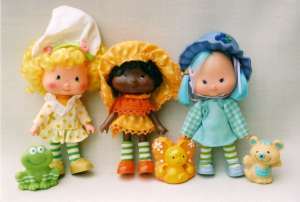 Strawberry Shortcake and her friends were sold by Kenner, though some were issued through Palitoy. Each character had its own hair colour or style, and, of course, a special fruit perfume so that they smelt of their name. By 1982 there were fourteen little dolls in the range, all with delicious names such as Lime Chiffon, Raspberry Tart, Lemon Meringue, Angel Cake, Apricot, Cherry Cuddler, Butter Cookie, Apple Dumpling, Orange Blossom and Strawberry Shortcake herself. 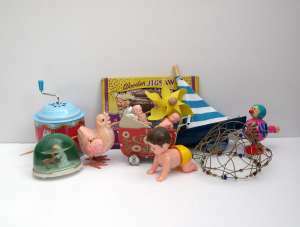 The dolls came with their own pets, and had accessories such as houses, vehicles and shops. This same decade saw Rainbow Brite, Care Bears, Moon Dreamers, Flower Fairies, Sylvanian Families, Fairy Tails and Lady LovelyLocks â€“ all toys carefully designed so that a child needed several of them, plus the various accessories, in order to obtain the maximum play value. Of all the character toys, perhaps Sylvanian Familes was the most successful, offering maximum play value. The little animals first arrived in Britain in 1987 though were copyrighted in 1985; a selection of mice, bear, rabbit and racoon families. They were made by Epoch in Japan, and distributed by Tomy. The two main families were the bears, the Evergreens and the Timbertops, each with ten members, and the adult characters stood around 3.5 inches high. The youngsters were slightly smaller. Nowadays there are dozens of different creatures in the range from penguins to moles. Sylvanian Families are still sold today, now made by Flair, and the buildings and accessories are particularly sturdy and well designed. Many of the pieces of furniture and smaller items are bought by adults who use them in their own dolls’ houses! Dolls houses have been popular for centuries; although most are made for young girls, many have been created for adult collectors. At Windsor Castle is a spectacular dolls’ house which was originally made for Queen Mary in the 1920s, and it is packed with valuable treasures such as miniature hand-written books by famous authors, and tiny items of furniture created by craftsmen. 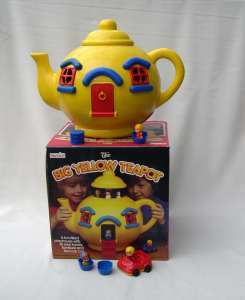 More recently, dolls’ houses have taken a new form, with toys such as Palitoy’s Treehouse, the Matchbox Play Boot and Bluebird’s iconic Big Yellow Teapot, whilst Fisher Price have produced several designs including the Fisher Price A-Frame and a Tudor Style House. Young girls take great delight in imitating their mothers; they love toy vacuum cleaners, washing machines, cookers and baby doll equipment. The Casdon company specialises in making child-size versions of many modern appliances, in both regular colours and in pink. 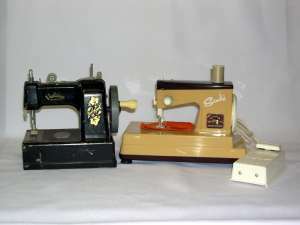 Casdon models are identical to full size branded goods, and include child-size working versions of both the red Henry vacuum cleaner and the pink Hetty type. They also make versions of Delonghi microwave ovens and Hotpoint electric cookers. Fisher Price has long produced colourful mini kitchens and cookers, while other companies such as Child Guidance made items ranging from microwaves to food mixers. 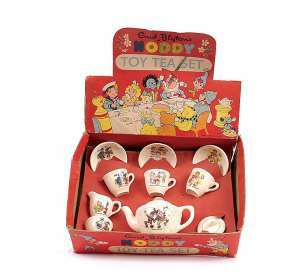 Tea sets are a popular and traditional toy, which often feature designs of favourite characters, including Noddy and Mickey Mouse. Some bear royal designs â€“ in the 1930s a set had pictures of Princess Elizabeth and Princess Margaret Rose â€“ while others featured nursery rhymes or delicate flowers. Nowadays, many are made from pink plastic! The pink and girlie explosion seemed to begin in the 1960s, and has escalated. Today, the sheer variety of girls’ toys is breathtaking. As I point out in my new book ‘Collecting Classic Girls Toys’, girls are fortunate. They can play with any toy they choose. But boys refuse to play with anything doll shaped. Especially if it’s pink! 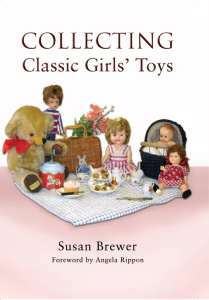 Collecting Classic Girls’ Toys by Susan Brewer is published by Pen and Sword, 2010.